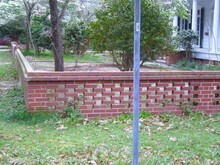 Pierced brick walls are a great alternative to traditional screens, such as lattice or some type of natural hedge. Homeowners also use them strictly as walls around the borders of their property rather than screens. Brick walls are definitely more durable and they lend permanence to your landscape. A well-planned landscape with complimentary hardscapes can create an attractive garden. 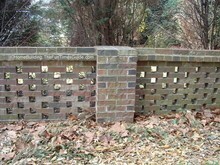 Pierced brick provides privacy and air flow while providing only a hint of what’s in your garden by passersby. This particular style of masonry has been around for quite awhile. I see the pierced brick wall style every once in awhile and it’s interesting to see the slight variations that each homeowner has chosen for their wall. It happens to be one of my favorite configurations when using brick. Basically, the differences seem to be the height of the base for the pierced portion of the wall, the pierced configuration itself (alternating half-bricks vs. using all full-sized) and having either an integrated column or a traditional one. Another variation is the choice of colors used for the bricks. I personally prefer variations in tone of the same color group vs. one single color used for all courses. I might as well list the other two variances that I tend to notice with pierced brick walls. The color of the mortar. Red mortar…nope…don’t like it. Just use the standard gray. Please don’t add oxide pigments to your mix, people. Natural looks best in this application.You don’t want the mortar to attract attention. It’s much more attractive when it blends with the surrounding material. The surface of the bricks themselves. Smooth vs. Rough. I prefer rough bricks as they seem less formal and lend character…as in instant aged. If you are going for a more formal look, definitely choose smooth over rough or pitted. 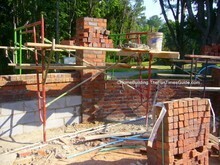 My favorite….handmade and/or reclaimed bricks. Go Green! 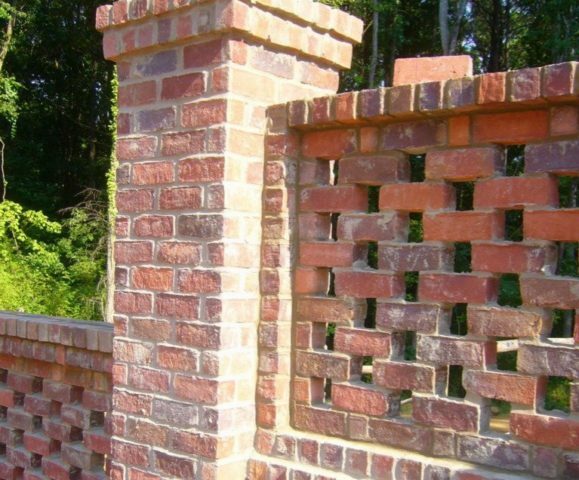 Choose reclaimed bricks! Old Mississippi Brick Co. is a great source of reclaimed bricks if you’re looking for the ultimate in getting the instant aged look. Old Carolina Brick Co. is another great source. There are many others that you should consider. Look in the phone book… yes… the phone book, as well as looking online. 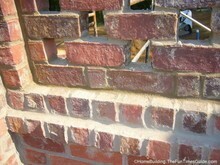 Buying reclaimed bricks is a great green choice these days and it’s plentiful. Look into it before making your choice. Robin Williams and Associates photo gallery. This is a great idea site. Mouse over the Our Work tab to view the galleries. 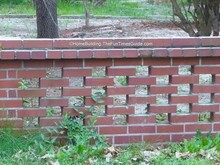 Variations Of Handmade Bricks were used in this large project at the English Cottage I featured in 2006 here on The Fun Times Guide To Home Building.